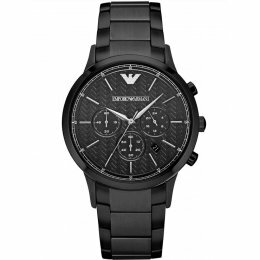 The Emporio Armani AR6089 Men's Watch is fitted with chronograph quartz movement. It has a navy blue dial with silver toned hands and index hour markers. The Armani AR6089 Watch has a black croco-embossed leather strap and is water resistant to 165 feet. 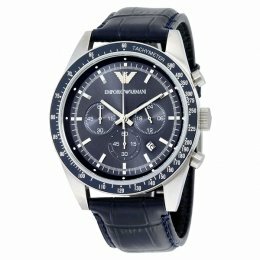 The Emporio Armani AR2485 Men's Watch is fitted with chronograph quartz movement. It has a black stainless steel strap and case and a black dial. The Armani AR2485 Watch has slim fitting hour markers and hands to showcase the 12 hour display and a date function. 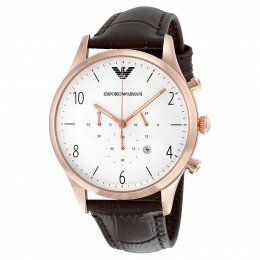 The Emporio Armani AR1916 Men's watch is a quartz movement watch. It has a matte white dial, accented with three subdials. The Emporio Armani AR1916 Watch has a brown crocodile embossed leather strap and is water resistant to 165 feet. 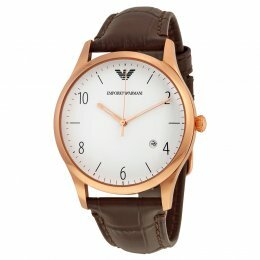 The Emporio Armani AR1915 Men's Watch is brown, crocodile leather men's watch. It has a matte white dial, accented with a rose-gold case. The Emporio Armani AR1915 Watch is designed with a scratch resistant mineral crystal case and a designer EA eagle logo.